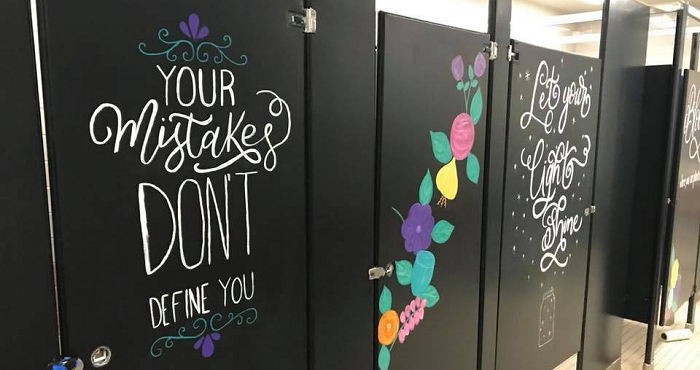 When the parents of Mary Moore Elementary School hoped to brighten the monotonous bathrooms with inspiring messages and encouraging words, they had no idea just how far their message would spread. 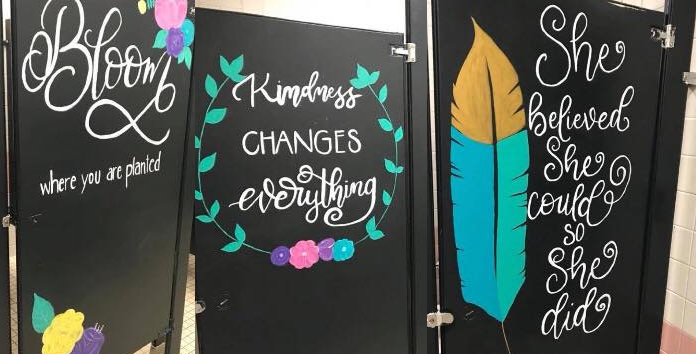 They wanted to do something that would leave a lasting impression on the students, and they thought that putting messages in the bathrooms and hallways would be the best way to do it. They gathered supplies and kept it a secret from the students, stunning them on a Monday morning! Eight parents cleaned the bathrooms, scrubbing them to make sure that the paint would stick. They painted everything black to give their murals a high contrast. They planned out their designs and spent a lot of time perfecting them. The parents worked together for 37 hours over the weekend, transforming the 5th grade bathrooms as an incredible surprise to the kids. The students had no idea that the remodeling was going to take place, and they were stunned to see the new and improved bathrooms giving them an extra boost whenever they needed a break. The motivational murals went viral almost instantly, with hundreds of thousands of people falling in love with their work! Other parents hope to do similar works at their own local schools, and if it makes even one student feel better about themselves, it would be worth it!